One month after Adam Wilson, an 18-year-old student from the UK, arrived in China to study at Peking University, he was swinging by the supermarket to grab snacks for a gathering that night with friends when he noticed something a bit, well, different. Wilson had wanted to buy some potato chips, just the original flavor or maybe the cheese ones that he'd loved since he was a kid; but when he arrived in the snack aisle, he discovered a whole new world of potato chips that he had never imagined. "There was cucumber flavor, blueberry flavor, braised pork flavor, and numb and spicy hot pot flavor!" he recounts, still, seemingly, in awe. "Those strange flavors took up the entire wall of four shelves in the potato chip section." Wilson found himself frozen with wonder. "I stood in front of that shelf and wondered, what are those? Do they taste good? And where are the classic salty and cheese flavors that we Westerners are used to?" Finally, he dug up a bag of original-flavor chips from the bottom shelf, but by this time, his curiosity was piqued. Having failed to find his preferred cheese flavor, he figured he would try something new. He knew that he liked Sichuan hot pot, so he bought a bag of numb and spicy hot pot chips and a bag of blueberry chips. The purchase was originally driven by a mixture of adventurousness and morbid curiosity, but to Wilson's surprise, some of the snacks were actually pretty good. "The blueberry flavor sounds crazy in theory, but actually, the taste of the blueberry is underscored by the saltiness of the chip. The two complement each other; it actually works," Wilson said. "And the hot pot flavor is more fun to eat. They scorch you with real dry-chili heat, not just that red powder that feigns spiciness, and capture the piney taste and euphoric numbing effect of Sichuan peppercorns. I feel like I have stuck my tongue in an electrical socket," he laughed. Wilson is not the only foreigner who's noticed the unique fusions of Chinese and Western flavors in China's imported snack market. Perusing online forums like Reddit or Quora, you can find plenty of inquiries from expats and tourists as to why the cola tastes different in China, or why the chocolate has a different texture. Though well-known products obviously have to maintain some degree of consistency around the world, many brands end up tailoring the flavors of these products to regional tastes. In a huge, diverse country like China, that can mean the birth of some interesting innovations. Love them or hate them, there's no denying the fun that they bring to snack food in China. It isn't just chips that have gotten a makeover in China, Wilson soon discovered. He's also found that Snickers, Oreo cookies and Diet Coke all taste a little bit different in China. "The chocolate tastes grittier, more powdery and less sweet than English chocolate, and the Diet Coke tasted less acidic here," Wilson said. "I accidentally bought matcha-flavored Oreos once," he added ruefully. "I've found that Chinese people have a special affection for matcha-flavored things. Like a few days ago, I found that at McDonald's, they only sell matcha-flavored soft serve." He remains amazed by the diversity of options when it comes to Western junk food. "Classic Western snacks seem to have tons of flavors in China. It's really innovative. Although I am not a big fan of some of those inventions, like the matcha Oreos, it's interesting how they combine Western snacks with local character. It's really fun. I think I might even miss these crazy flavored snacks when I go back to the UK," he said. But arguably no one has deeper feelings about the fusion of Chinese and Western junk food than Chinese students studying overseas. Twenty-two-year-old food blogger Wang Diandian, who has over 370,000 followers on her Sina Weibo, lived in the US for four years while attending Brown University, and in that time became something of an expert on the differences between Chinese and Western junk food. For instance, Wang has found that packaged snacks in Western countries usually have a stronger taste than the Chinese versions - the crackers are cheesier, the cookies more buttery, the soft drinks even sweeter. She also found that snacks seemed to have fewer flavor options in Western countries than in China. "Like my favorite flavor of potato chips is cucumber, but I could never find it in the US," she said. "In the US, they stick more to the original flavor, or flavors they're used to in their daily diets, like barbecue or cheese." In China, meanwhile, you can find over 20 different flavors of potato chips, while cookies boast frosting flavors that include strawberry, mango, blueberry, matcha ice cream and more, Wang said. She believes that the diversity of options in China has to do with the localization efforts of food companies. For instance, she said, in Japan, you can buy soy sauce-flavored potato chips. "Since China has more cuisine styles, and each style has distinct characteristics, the food companies have to be more innovative to accommodate the different tastes in this huge market," Wang said. "I think it's a really good thing. Every international brand needs some localized elements, and for foodies like me, it offers more choices and makes eating more fun." Chinese consumers aren't the only ones who enjoy Asian variations on Western snack food. When studying at Brown University, Wang would often take a bus to Boston's Chinatown just to buy some Chinese snacks at the supermarkets there, like cucumber potato chips, or Kangshifu cookies with lemon icing, and her American classmates really liked them. "Most snacks in the US have just one flavor, so they're just salty or just sweet, Wang said. "So they thought it was interesting to have cookies that tasted both sour and sweet." Another trend that Wang noticed is that the Chinese snacks often imitate the flavors of Western food - for instance, potato chips flavored like French roast chicken or Italian braised shrimp. "I guess that has something to do with Chinese people still believing that Western food is more high-end," she said. In recent years, international food companies have been attaching growing importance to overseas markets, especially in developing nations such as China and India, as the increasingly prosperous consumers there gain an appetite for American-style "on-the-go" food. Another reason for companies' increased focus on overseas markets is flattening growth in domestic markets. A New York Daily News report in May 2012 showed that growth in the US snack food industry was virtually flat over the preceding two years, based on data from market research firm Euromonitor. Meanwhile, combined sales in China, Brazil and Russia - three major developing markets - rose 15 percent in 2010 and 11 percent last year, hitting $17 billion. As a result, international food companies have been jockeying to achieve market growth overseas. According to the New York Daily News report, Kraft Food Inc., the maker of Oreo, introduced the cream-filled cookie to China in 1996, but it initially met with a cool reception. So in 2006, Kraft worked with a panel of consumer taste experts from China to identify the characteristics that would appeal to Chinese tastes, and the research showed that Chinese don't like their treats as big or as sweet as Americans do. Based on this research, the company made a new version of the cookie for the Chinese market that was smaller and less sweet. Kraft later went even further, rolling out new flavors for the cookie, like green tea ice cream, raspberry and blueberry, and mango and orange, based on the flavors of popular Asian desserts, said the report. Their efforts paid off - for the past three years, Oreo has ranked No. 1 in China's cookie market, according to a jiemian.com report in March 2015. 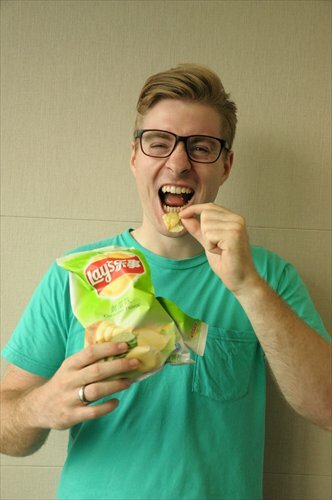 Potato chip giant Lay's has also taken major steps to cater to the Chinese market. According to a November 2013 report by the Chinese magazine Business Leaders, Lay's began its localization efforts in the 1990s, launching the Peking duck flavor, and then later rolled out the cola chicken and spicy ratten pepper fish flavors. It also offers chips with flavors like hot and sour fish soup, which is a popular dish in China. These product innovations have delivered an eight percent rise in sales every year. Wang said she hopes that there will be more localized versions of Western foods in the future. "China has many different culinary styles, as well as many local ingredients, so I expect there will be more pleasant or funny surprises when classic Western snacks combine with local flavors," Wang said. "I'm really looking forward to that!"